We were sitting on the dining room floor or our dark, dank basement apartment wondering why we weren’t as successful as we wanted or hoped to be. We had just admitted to each other how much credit card debt we each had, a grand total of $51,000. We were living naively, unconsciously and fabulously broke. If this sounds at all like you, join us and hundreds of other LGBTQ people working towards financial security. Do these sound like familiar questions? Why weren’t our lives going as planned? Could a group like this have helped us? In the early 2000s, life was great! We were beginning our careers with good jobs at Fortune 500 financial services firms. We were earning decent money with all indications suggesting our climbs up the corporate ladder were inevitable. Tuesday night, dancing at Bent – check! Wednesday night, dancing at Wave – check! Thursday night, drinks at JR’s – check! Friday night, happy hour and dinner out with the boyz – check! Saturday night, dancing at Tracks – check! Sunday morning, brunch – check! Sunday night, tea-dance – check! Throw in designer clothes and travel, and we were living the dream. We never missed an opportunity to see and be seen. Going out meant seeing our adopted family, meeting new guys and just plain old having a good time. They say meeting someone at the bar never works, but we met each other on the dance floor at Tracks – the old one, not the new one for those who know Denver’s gay-scene. Shirtless and gyrating to the music, we met in a mist of manufactured fog and the sound of Deborah Cox in the air. Of course, it wasn’t until a few years later, after getting to know each other and becoming friends, that we finally did the deed. When we first met, we were both in long(ish)-term relationships. When we did make it official, whew! It was amazing. We were in the romance and infatuation phase of love and couldn’t spend enough time together. This twitterpation meant calling in sick – cough! cough! – to work a lot. We quickly cohabitated in our friend’s basement apartment. At that time in our lives, we were more concerned about our BMI than our credit score. We spent way more time at the gym than we ever talking about money they way successful people do. We were the cobbler’s kids but with unfortunate shoes; we were helping others manage their money when we weren’t helping ourselves. After spending the weekends in the mountains and looking at property to build a vacation home, we had the clarity that we could barely afford to pay for a weekend in a hotel in the mountains, let alone buy land and build property there. How could we have a vacation home when we didn’t own a home from which to vacation away? We really could’ve used this. 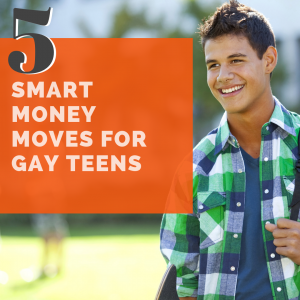 We realized that for the previous few years, we were spending unconsciously and beyond our means to make up for being bullied and picked on and, in David’s case, banished from ever seeing his family for being gay. We found an accepting family in the gay-scene. You may be able to relate. It may not be exactly the same, but then again that was 15 years ago. Even though it felt like we were home for the very first time, we still harbored feelings of inferiority and self-doubt. To compensate, we spent and lived like the other successful gays. They had new clothes. We had new clothes. They had new phones. We had new phones. They went on fantastic vacations. We went on amazing vacations. You’ve gotta keep up, right? This moment, that night sitting on the Berber carpet of our basement apartment that never saw the light of day was our rock bottom. Here we were two financial services professionals making good money and bad decisions. We were the gay cliché of living fabulous but being fabulously broke. It had to end for us. We the ending we wanted. We were tired of being fabulously broke. 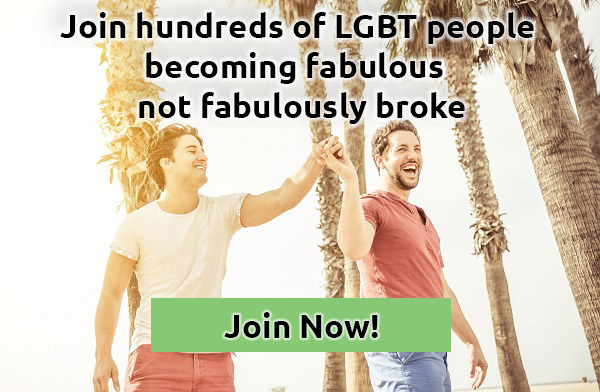 If you’re tired of being broke, join us and hundreds of other queer people and allies in our private Queer Money™ Facebook group. It was then and there that we decided to turn our lives around. Shortly thereafter, we created a plan to get ourselves out of debt. With trial and error, we paid off all $51,000 of our debt. Soon after that, we moved out of that basement apartment into a 12th-floor condo in a building that overlooks downtown Denver and the Rocky Mountains. We’re now some of the last people in Denver to see the sunset every single day. Not long after that, we went on an all-cash vacation Down Under for 30 days in Australia and New Zealand. We attended Sydney’s Mardi Gras, which is Sydney’s Pride. We saw Kylie Minogue perform live in her home country. We snorkeled the Great Barrier Reef off the coast of Cairns Australia, and we swam with wild dolphins off the coast of Kaikoura New Zealand. We returned with a fortune in memories and not a single penny on our credit cards. This is the life we want all our LGBTQ brothers and sisters to live. If you’re buried in debt and can’t figure out how to get ahead, if your credit score is so bad it’s hard to get a job, or if you feel stuck living beyond your means because you don’t know how to live on any less, we’re here to help. We’ve had these feelings and worse. To repeat another cliché, we’ve been there, done that. After we paid off our debt, we used both our personal and professional experiences to write a book to help others get out of debt. 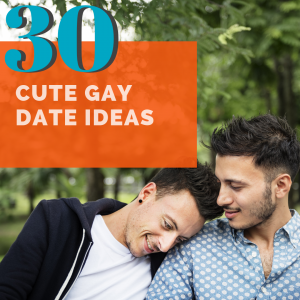 Our book evolved into a blog, and our blog evolved into our podcast, and our goal is to help LGBTQ people live fabulously, not fabulously broke. If you’re seeking financial security and success, join our private Queer Money™ Facebook group. Things don’t change unless we changed. We change, and so can you. 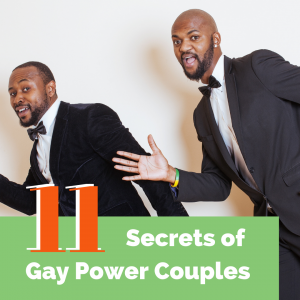 We believe that a strong queer community that can withstand political and social turmoil requires financially strong queer individuals and allies. That’s why we write, blog, speak and podcast about all things money for our LGBTQ brothers and sisters. Join us! I love this story! We’re only a few months into our debt payoff, and I can really relate to the unconscious spending AND trying to keep up. Thanks for sharing! !